I’ve been lucky the last several years. I work in a job that is not closed on holidays yet I haven’t worked Christmas Day in any of the years that I’ve been in Michigan. I wasn’t quite as lucky this year. The way we work it is that everyone works two of the winter holidays (Thanksgiving, Day After Thanksgiving, Christmas Day, New Year’s Day). J was due with B on Thanksgiving so I was out those two days which left me Christmas Day and New Year’s Day. I knew it was going to happen, so it wasn’t a surprise when the holiday schedule came out. The biggest problem with working Christmas Day is finding someplace to eat. The company will buy if we can find someplace open. For the past several years, the Christmas Day crew has been ordering from XO Aisian Cuisine in downtown Grand Rapids. Most of the people who work Christmas are non-Christmas celebrators so they work it every year and they wanted to do something different. I was fine with that as I really don’t like most Asian food. One of the guys working this day is of Middle Eastern heritage. He suggested we do Mediterranean food and he knew a place that was going to be open. Everyone was pretty excited to try something new, so they told him to go for it. 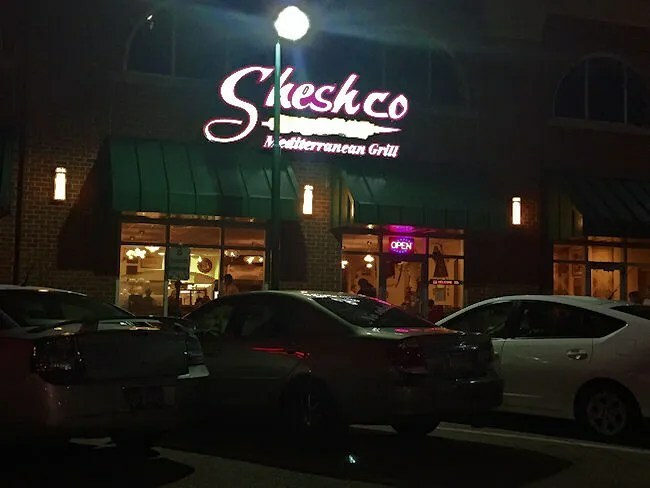 The place chosen for our Christmas meal was Sheshco Mediterranean Grill in Grand Rapids. The restaurant is part of the Celebration Village just inside the city on the northeast side of town. The restaurant is actually on Celebration Drive, but it’s easier to say the corner of Knapp and East Beltline. I haven’t had much experience with Mediterranean food. 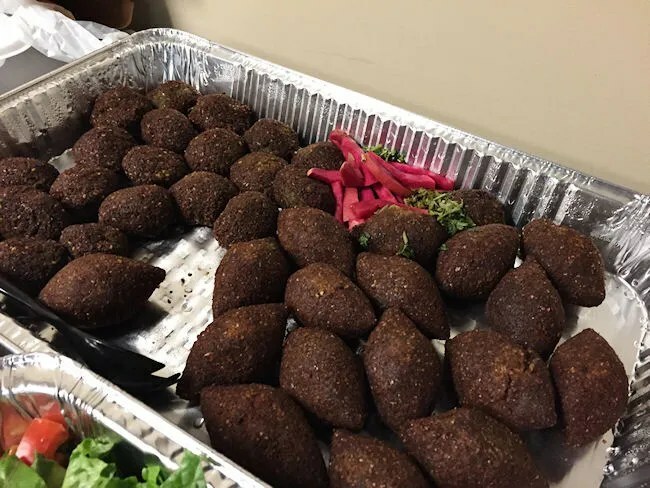 When we lived in Peoria, IL, there were a lot of Lebanese restaurants and I tried some things , but was never a huge fan. I was assured that I would like this place and to just trust my co-worker, so I did. By the time I got to work at 3:00, he had already put in the order for the whole building. He sort of went the catering route, but sort of off the menu. There was enough for twenty people to eat with a few leftovers to snack on later. He had arranged to have the whole thing delivered around 5:00 so those that worked days and those of us that worked nights could all have a meal together. When the food arrived, it came in large foil pans. We set them up in the break room then all gathered for dinner. Our Middle Eastern colleague explained what everything was and then we all went to town. I saw a pan full of meat so, obviously, that’s where I went. The pan was full of Shish Kabob and Shish Tawook. 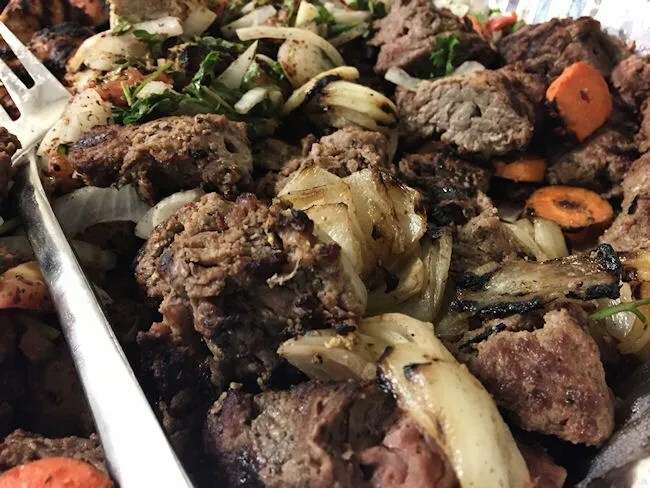 The kabob is marinated and charbroiled beef tenderloin while the Tawook is chicken with the same treatment. I grabbed several of both and both of them were incredibly delicious. The kabob was so tender and had such huge flavor. I kept going back for these. There seemed to be a big flavor from garlic and that anchovie taste from Worcester sauce. 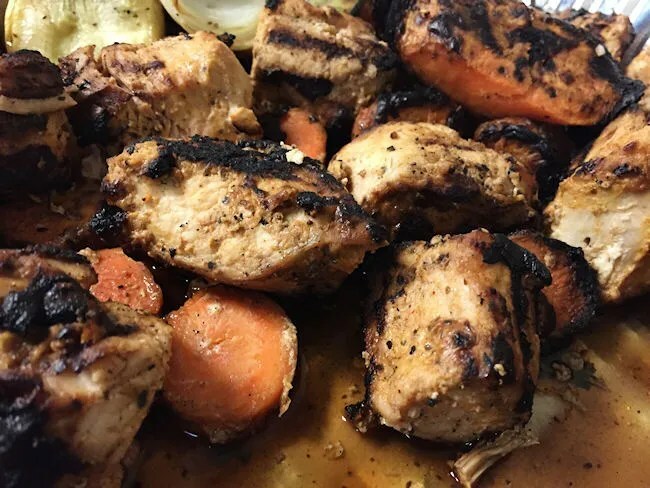 The meat was just a little pink in the center, but it was so tender from the long marinade that had broken down much of the fat. The Tawook was just as good. The flavor wasn’t as bold as it was with the kabob, but these had much more of a grilled meat flavor to them. The shish tawook was incredibly popular among our little group and didn’t last long. 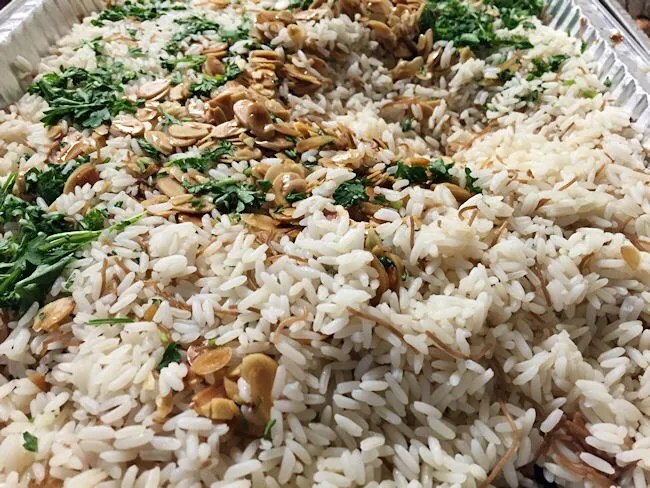 The other thing that I was really pushed in to trying was what I believe is called Toum in Lebanese cooking. 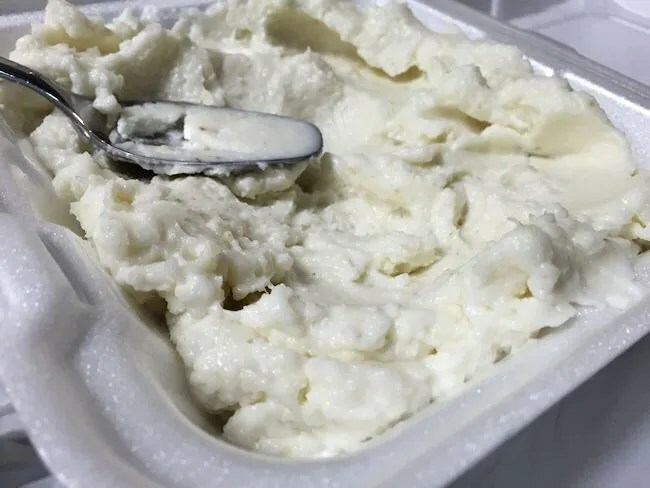 It’s a garlic sauce made with a lot of garlic and vegetable oil. 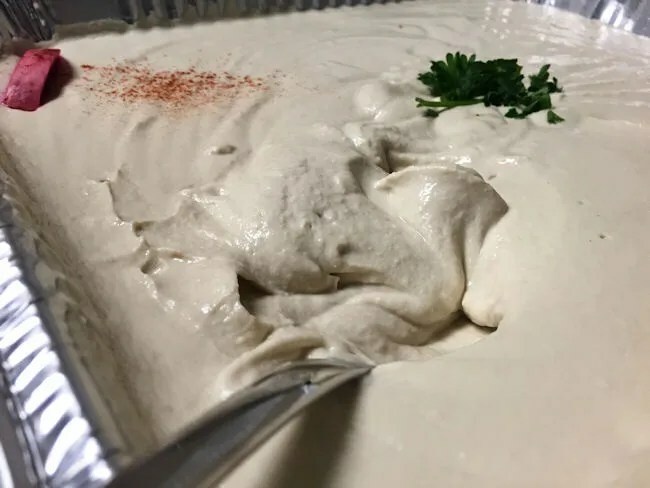 It sort of looks like a mayonnaise, but has a very, strong garlic flavor that is perfect with the pita bread that it comes with. This was another hit in our office. I was so-so on it. It was good, but I couldn’t eat a lot of it. 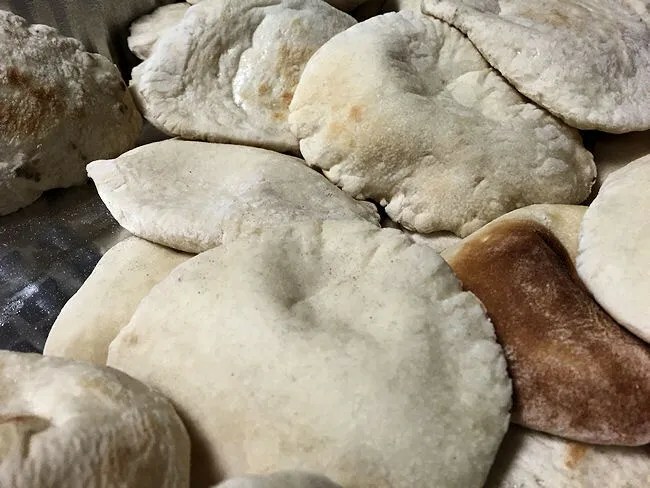 I ended up eating a couple more pieces of the pita bread by itself because that was delicious on it’s own. 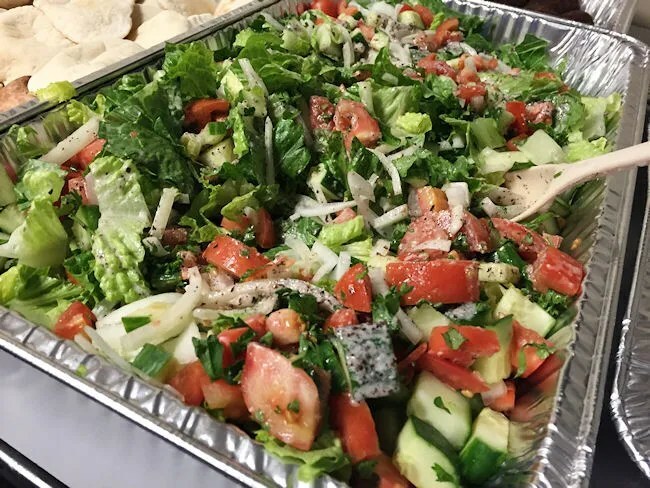 Our order also included falafel’s, fried kibbeh, tabbouli salad, as well as a big pan of rice and some grilled veggies. I didn’t try any of that because the meat was so good that I stuffed myself on it instead. I know the bill was quite large, but I never really asked what it was. The entree’s go all the way up to $20 on their own and we had several of those (multiple orders of the kabob and tawook’s). I wouldn’t even want to guess what we paid for this Christmas dinner. 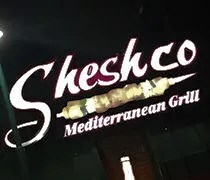 Sheshco Mediterranean Grill was really my first real foray into Middle Eastern food. I have tried things here and there, but having someone that knew what they were ordering was really helpful in guiding more towards giving this a shot. I was pretty hesitant at first when the idea was brought up, but in the end, I’m glad I tried something new and while I won’t be racing to try other places, I’m happy to know that places like Sheshco exist and aren’t as scary as I once thought they were.